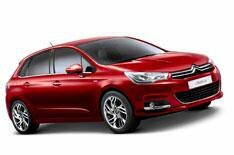 Citroen's all-new C4 small family car | What Car? Citroen has pulled the wraps from its all-new C4 small family car which goes on sale in the UK early in 2011. Following on the heels of the new C5 family car and C3 supermini, Citroen says the C4 will bring exceptional levels of quality, style, interior space and comfort. The manufacturer also promises responsive handling and models with CO2 outputs of 109g/km from launch and, later, 99g/km. The new C4 is a little bigger than the model it will replace, although it now boasts a much larger boot of 408 litres one of the biggest in the class. Comfort is a clearly a key priority for the C4, with massaging seats an option, but it will also be personalised and high-tech. Drivers will be able to adjust the colour of the instruments and select from a range of polyphonic sound alerts. There's also a new blind-spot monitoring system, active headlights, a speed limiter that knows the limit of the road you're on. An 'eTouch' system is designed to help owners monitor their driving patterns and improve their fuel efficiency with advice. The new C4 makes its first appearance at the Paris Motor Show in October and is likely to cost from around 15,000.